At IBC 2017 I met up with Walter Diaz from Tilta and he showed me the Tilta Nucleus M Wireless Follow Focus System, which seems to be pretty sweet deal. 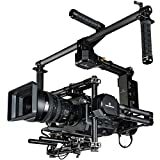 It’s a complete wireless follow focus system where you have full control of focus, iris, and zoom on Cine lenses or compatible “cine-moded” DSLR lenses. Ideal for 3-axis gimbals, shoulder mounts systems, and drone shoots. Compatible batteries – see at the end of this article! The handgrips have a range of about 100 meters and the FIZ uit up to 500m, but with the included long range antennas this extends up to just under 2000 meters according to Tilta. Pretty impressive. Perfect for drone operations. The FIZ hand unit is capable of controlling 3 channels – focus, zoom, and iris as well as overriding the hand grips. Motors can be calibrated on lenses without hard stops – such as photo-lens with follow focus gears and they will fit standard 15mm and 19mm Rods. The throw of the control can be adjusted so you can have a very smooth control of ex. the focus. This can be done on either the FIZ unit or the handles. Update from Tilta: They will think updating it so it can be programmed to focus from point A-B and follow on auto instead of manual? That’s nice. Pair this, either the hadles or the FIZ unit with a monitor with wireless transmission and you have the perfect focus puller system. Tilta has R/S Cables available for Arri, RED, Sony, Panasonic, and 2.5mm LANC and R/S can be controlled from either the handles or the FIZ unit. The whole package retails for $1,199 US which is an amazing price. We hope to get a system in for a review so we can test this our selves.